Lisa and I were invited to participate in a Blog Tour promoting a new non-denominational Christian women's Bible study titled Reflecting Him: Living for Jesus and Loving It. After receiving the review copy, I realized that I've never participated in a Bible Study before. The study appears very straightforward, using familiar objects and situations on which to focus each week, drawing comparisons that help women become aware of Jesus working in various areas of their daily lives. The study also has an online component through a Reflecting Him Bible Study Group on Facebook. Individuals working through the study on their own can still get the benefits of a group discussion while working at their own pace. Almost 200 people are in the group already and the discussions are really taking off. This fall a leaders guide, videos, and music will be released to accompany the study. As part of the blog tour, I had the opportunity to interview the author, Carla McDougal via email. I’ve never tried a Bible Study before, but yours really sounds interesting When you’re speaking to women who have never joined a Bible Study before, how do you describe this process to them? I would describe a Bible study as one of the most exciting adventures! God has so many treasures waiting for us to discover in His Word. As you begin your study ask God to help you carve out time during the day to do the study. Maybe the best time for you is getting up 30 minutes earlier in the morning… your lunch break… while waiting in the car line at school… during your child’s baseball practice… or right before bed. You find a time that works best for your schedule. Every time before you do your study ask the Lord to open your heart and eyes to what He wants to teach you. Oh, what sweet nuggets He has waiting to shower you with each time you meet with Him! What do you see are the benefits of doing a Bible Study? The more we read and study the Bible, the more we grow spiritually. As our spiritual life deepens we become a stronger reflection of Jesus to others. The goal for believers is to become more like Jesus. The way to do this is to know Him more and more. By studying the Word of God we begin to see spiritual lessons in our everyday experiences. For example, in Week 2 of Reflecting Him we focus on the Pottery Process. We look at the physical aspects of the potter, the clay, the spinning wheel, the uniqueness of each pot, and the firing process. Then we compare those characteristics to what God says in the Bible… “We are the clay, you are the potter; we are all the work of your hand.” (Is 64:8) God is molding us into what He wants and has designed for each of us. Throughout the New Testament Jesus used tangible objects to teach spiritual lessons. This is still true today. Oh, it is so much fun to discover new truths in the Bible and apply them to our everyday lives! Is your study designed to be a solo process or group activity? It is truly designed to be done either way. If you are doing it on your own we have a Facebook Reflecting Him Bible Study Group you can join and work at your own pace. This is a wonderful way to learn from one another. But, if you choose to do this as a group it works great too. You still work through the study on your own but once a week you meet and discuss the lesson together. This is a great way to learn from others as well. We have a Leader’s Guide coming out in August and a DVD which includes original music videos from singer/song writer Cindy Vinson’s album “An Invitation”, a 10 episode mini-series called “Behind the Veil” and me helping move the episode to the lesson each week. Each episode will be 30 minutes in length. Reflecting Him is designed for either on your own or a group. The exciting part is you are studying God’s Word which brings freshness and nourishment to the soul! The study appears to be a very personal activity as it really requires the participant to meditate and dig deep to answer some of the questions. What are the benefits from doing this in a group setting? I love that God is so personal with each one of us. Because we as individuals are so different He speaks to us in a variety of ways and we can learn from one another. This is the beauty of coming together after going through it on your own. Learning, growing and praying together! We lead such busy lives, in your experience how much time do you suggest women anticipate or schedule / allow for each daily study? It depends. I would say 30 minutes… the time it takes to wait for your child at a dance lesson or piano lesson. Week 1 appears to be an introduction only, where Weeks 2-9 have an introduction in addition to daily pages. Why does it begin this way? Week 1 is basically for you to get to know the heart of the author… me. As well as a time of analyzing where you are in life right now. Personal questions getting the reader to think about why she is doing the study, what she hopes to gain over the 10 weeks, where she is in her walk right now. If you look at Week 10, I ask you to look back at Week 1 and reread these questions. It is awesome to evaluate where you were and where you are now! What inspired you to write this Bible Study? After speaking at retreats and conferences for a few years women continued to say, “Carla, you share so many real life stories and see spiritual lessons embedded in these experiences. How do you see those Biblical truths in everyday life?” I realized it was because of my many years of studying God’s Word that changed the way I look at circumstances and the little things in my day. Just as Jesus used tangible objects—a net, fish and bread, a tree, birds, and so many other things—to teach life lessons we have access to the same learning today. The problem is we are in many cases too busy with our agenda’s and schedules to stop and notice the lessons all around us. This fanned the flame for Reflecting Him! Carla McDougal is the founder of Reflective Life Ministri es and Share Fair, an annual conference for connecting, equipping, and encouraging women in ministry. 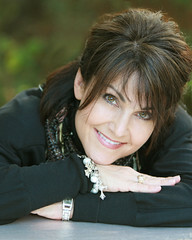 She speaks at women’s events, retreats, and conferences in the U.S. and internationally. Carla married her high school sweetheart, Fred, and they have four children ages 16 to 23 and live in Magnolia, Texas. 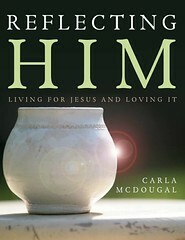 Reflecting Him: Living for Jesus and Loving It (WinePress Publishing, 2010) is Carla’s first book, although she’s been involved in leading and teaching Bible studies for more than 20 years. Carla writes a Monday morning e-votional at her blog, Carla's Corner. Want Carla To Lead a Lesson for Your Bible Study Group? With every group purchase of 25 or more studies before August 1, Carla will lead a tele-lesson (over speaker phone) for one of your group meetings. Please email windy(at)reflectivelifeministries.org to purchase books. Mention the blog tour and tele-lesson at the time of ordering. You can purchase Reflecting Him through Amazon, Christianbook.com, or Reflective Life Ministries. The Reflecting Him Blog Tour, hosted by RedCouch PR, is June 20 - July 16. Yesterday's post was at Real Hurt, Real Hope and tomorrow's is at Kimberlee Conway Ireton's blog. Follow along to read a different guest post, interview, or review each day. Thank you so much for being part of the Reflecting Him Blog Tour. I love how the Lord connects people to accomplish His purposes! We are excited that a cd is being produced to accommadate the study. Also, we are producing a DVD to go with each lesson. To hear one of the songs visit our website at www.reflectivelifeministries.org. Thank you Lisa & Shelly for interviewing Carla. I hope others who have never participated in a Bible Study will see that it's not too intimidating. Every time I work through a study, my relationship with Jesus and my desire and confidence to share Him with others grow. Thank you for sharing your questions and Carla's responses with your readers.